SANTA CLARA, Calif., March 07, 2019 (GLOBE NEWSWIRE) -- Applied Materials, Inc. has been recognized by Intel as a recipient of a 2018 Preferred Quality Supplier (PQS) award. The PQS award recognizes companies like Applied that Intel believes have relentlessly pursued excellence and conducted business with resolute professionalism. 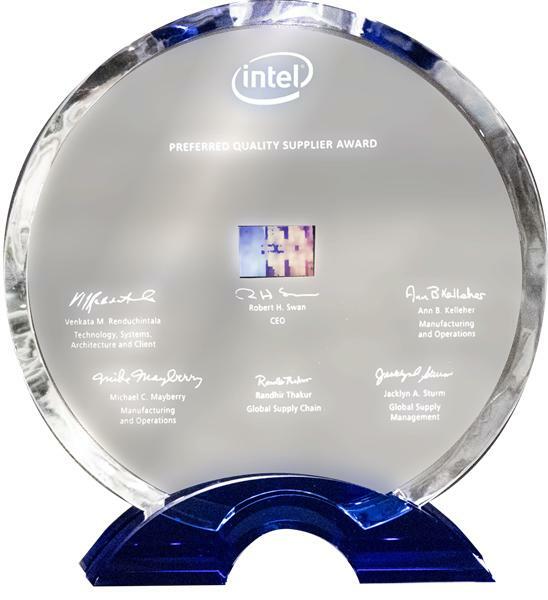 Intel 2018 Preferred Quality Supplier Award:Applied Materials, Inc. has been recognized by Intel as a recipient of a 2018 Preferred Quality Supplier (PQS) award. Intel and the Intel logo are trademarks of Intel Corporation in the United States and other countries. A photo accompanying this announcement is available at http://www.globenewswire.com/NewsRoom/AttachmentNg/dbd8bad4-6d51-491e-8fac-afebf603b9c6. This photo is also available at Newscom, www.newscom.com, and via AP PhotoExpress.